If you work in an office but wish you could work from home – research tells us you’re not alone. According to Global Workplace Analytics (GWA), two-thirds of employees wish they could work remotely. Incredibly, 36% of workers would actually choose the option of working from home over a pay rise. If that’s not a smart (read: frugal) business decision, I don’t know what is. Video Collaboration (VC) comes with tangible benefits to employees, employers and the planet – and VC is on the precipice of an almost exponential rise, especially in regions in Asia and Latin America. There are a number of reasons a business, no matter how small, should invest in VC. Namely, it’s a step toward joining the modern workforce. As someone who has been in the industry for a long time, I’m here to explain where the workforce is going – and what your business needs to stay ahead. According to Frost & Sullivan (2018), in the next five years, 35% of the workforce will work remotely, at least part-time. Why we’re moving in this WFH direction remains a chicken and egg situation, as we can’t tell whether society changed technology or technology changed society. As technology gets cheaper, more businesses are in a position to adopt it – this we know. This rings true especially for VC – as the sound and image quality increases, but the cost decreases, more people are able to work from home with products like BRIO. Office trends are moving towards open-plan, collaborative workspaces, many of which will be fitted out with the latest tech. Accompanying the proliferation of open plan, we’re seeing more ‘huddle rooms,’ small breakaway meeting rooms suited for 2-8 people. 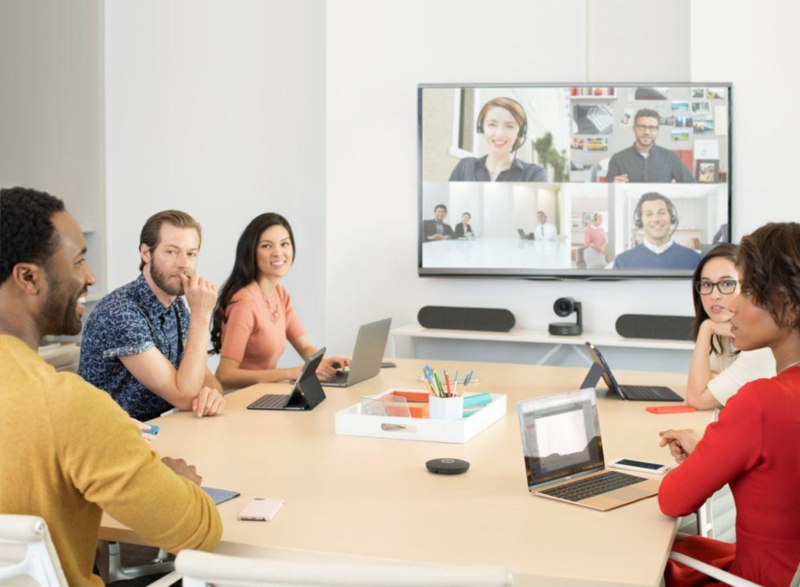 Products like MeetUp allow these spaces to become video conferencing rooms, allowing for businesses of all sizes to collaborate and work together, regardless of distance. In 2018, it’s increasingly uncommon to enter a room without screen sharing capabilities, let alone phone conferencing. Despite this, it seems okay that less than 3% of office meeting rooms are engineered for video collaboration (according to Microsoft). This is particularly pertinent when current research demonstrates how collaboration productivity is significantly improved when we can see the facial expressions of who we’re working with. Consequently, it’s important for a business to see who they’re speaking to, and VC can make that happen. Other generations in the workforce might believe that Millennials (born between 1981 and 1996-ish) are lazier than previous generations, for wanting to work remotely. Although this demographic is changing the way we work, arguably, it’s for the better. Millennials have made it abundantly clear that they want to be able to work flexibly, in large teams, and not necessarily in the same place. As a result of no longer being bound to one working location, more importantly, they are changing how we measure work. Where we used to focus on productivity related to time-spent in an office environment, now we’re looking more to actual output. Modern business tools like BlueJeans, Microsoft Teams, Google Hangouts, and Zoom, coupled with project management processes like Agile and SCRUM mean that we are no longer focusing on end results – but constantly measuring workers and their output, all the way along. Consequently, people can work (and be measured) anywhere, anytime. Businesses have an enduring belief that if you aren’t at work, you aren’t working. While we already mentioned how cloud-based software tools are enabling us to collaborate and still work outside of a traditional working space, it’s interesting to note that offices themselves aren’t particularly efficient spaces. Consider the last time you spent over an hour in an unnecessary meeting. Research backs WFH as well, reporting that over two-thirds of employers report increased productivity among their telecommuters (GWA). That’s important when considering that 36% of employees would choose the option of working from home over a pay-rise. Alongside this, 80% of employees consider WFH a job perk, and 95% of employers say that WFH has a high impact on employee retention (GWA). If the increased output is only one benefit of WFH, where the others are increased employee satisfaction – investing in video collaboration seems like a logical step forward. If your business goal is to ultimately attract the best labor and talent – why limit your talent pool to a one-hour vicinity of the office. With video collaboration, employees can live and work wherever, whenever. Considering urban housing prices, most people cannot afford to live in the heart of the city – though, that is where many industries are centralized. With the suburban swell, almost half of employees surveyed by the Global Workplace Analytics felt their commute was getting worse, averaging 90 mins in transit a day. VC not only solves this issue but provides a working and cost-efficient solution. Working remotely means your employees can be anywhere, which ultimately expands the talent pool worldwide. VC technology is now cost-efficient, scalable for businesses of all sizes whilst maintaining exceptional quality. Logitech’s most recent VC solution, Rally, exemplifies this. Whereas MeetUp was focused on equipping huddle rooms with VC technology, Rally is designed for medium to large conference rooms. With added RightSight technology to the 4K Pan-tilt-zoom camera, everyone will be beautifully well-lit – even if they are sitting in front of a window. Plus, for Rally we’ve split the video and audio in order to step up the sound quality. RightSound improves vocal clarity by suppressing background noise and echo, and focusing on active speakers so that everyone in the meeting can hear and be heard.